While a sneezing cat is not unusual, a cat that sneezes frequently in combination with other symptoms, such as a runny nose and excess discharge from the eyes, generally indicates your feline has a cold. 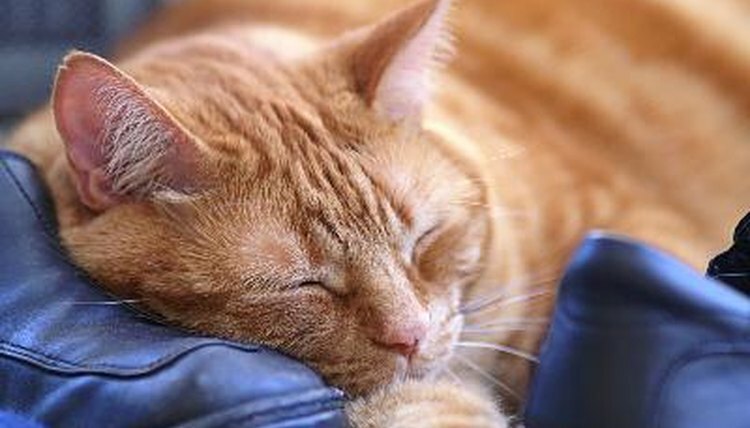 Some of the natural treatments for cat colds are not dissimilar to human natural cold treatments, such as administering vitamin C or creating a steam to treat congestion. Monitor your cat's progress during treatment and consult a veterinarian if she does not appear to be getting better. Relieve your cat's congestion by pouring 1 quart of boiling water over a heaped tablespoon of chamomile tea leaves in a pot. Place the sick cat in her carrier over the chamomile steam. Try placing the carrier on a low stool with the pot underneath it for best results, and drape a towel over the carrier so the cat can fully inhale the beneficial steam. You can also sit with your cat to do the steam. Hold her as close to the steam as possible with a towel over her head. Vitamin C boosts the immune system of humans as well as their pets, and provides the body with the necessary means to fight off colds. Crush a vitamin C tablet and mix it with a bit of tuna to provide your cat with a tasty yet effective cold remedy. You can also place the tablet in the back of her mouth if she is used to receiving treatments in this manner. Vitamin C is also recommended if your sick cat will not eat. Grooming is a natural way to help your kitty breathe easier. Grooming usually results in purring, which allows the cat to breathe more freely. The longer you can help your cat purr, the better she will feel. Use a standard cat brush or one with rubber bristles to groom your feline. Also try to pet her and show her affection, which will also help her purr. Give your cat small amounts of food that are easy to digest while she is ill. Create an herbal treatment for your cat by making a tea out of equal parts stinging nettle and marigold. Mix 1/2 tsp. of raw, unprocessed apple cider vinegar in with the tea as well as a small amount of raw honey. Use less than 1 tsp. of honey per mixture. Give your cat two dropperfuls of the mixture four times a day to help treat her cold.